Carbonation is an important part of the beer making process as it provides a sparkle to the dull, flat beverage, making it lively and fresh. 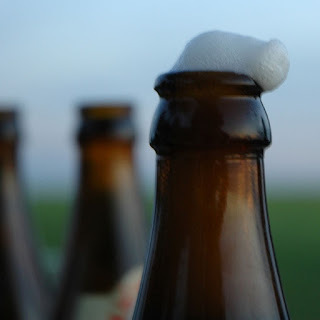 Carbonation gives the beer its fizz and bubbles and also helps to store the beer for a period of time. Beer can be carbonated in different ways and each method has its own advantages and disadvantages to the beer producers and sellers, but to the beer consumers the most important aspect of carbonation is its impact on the flavor and mouthfeel of the beer, and hence understanding the process of carbonation is essential to enjoying a good glass of beer. 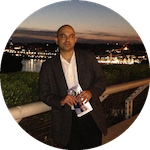 Two of the important attributes when dealing with carbonation which affects the beer flavor are the fizz produced by carbonation and the serving temperature. Higher the fizz, means higher C02, which tends to mask some of the delicate flavors of the beer, that result from its rich combination of malted grain, yeast and hops. Secondly serving the beer too cold, will also hide some of the flavor and aroma. Each style of beer has an ideal serving temperature, which preserves the beer flavor and gives it its characteristic mouthfeel. Darker maltier ales must be served at a higher temperature compared to the lagers as they have more complex flavors and a fuller mouthfeel. Beer can be packaged in a bottle or a can or served from a cask or keg which is referred to as 'draught' beer, also spelled 'draft'. Cask and keg each has its own process of carbonating beer using natural or artificial carbonation methods. 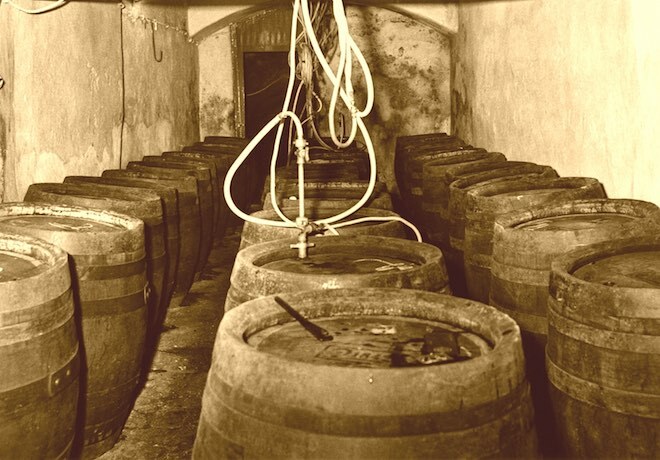 Traditionally beer has been conditioned in casks using a natural process of secondary fermentation which introduces C02 into the beer and gives it its bubbles. In the early 20th century, artificial process of carbonation was introduced as draught beer started to be served from pressurized containers called kegs. Each of these methods have its own advantages and disadvantages and importantly influence the flavor and mouthfeel of the beer. Cask or barrel conditioned beer has been the oldest way for carbonating beer. Typically, unfiltered beer after the fermentation process, is added to the cask without any artificial carbonation. Yeast and priming sugar are added to the beer which starts a secondary fermentation process in the cask that produces C02. The cask beer is then left to settle and condition for a few days before serving. Cask beers can be served by gravity dispensers or by hand-pump. Beer can be served directly from the cask using the laws of gravity, where it simply flows out of the tap and into the glass. The invention of the beer engine, allowed the casks to be conveniently stored away from the bar counter, a practice followed by most pubs. The beer engine was invented in the late 17th century by John Lofting, a Dutch engineer and entrepreneur who moved from Amsterdam to London in about 1688. 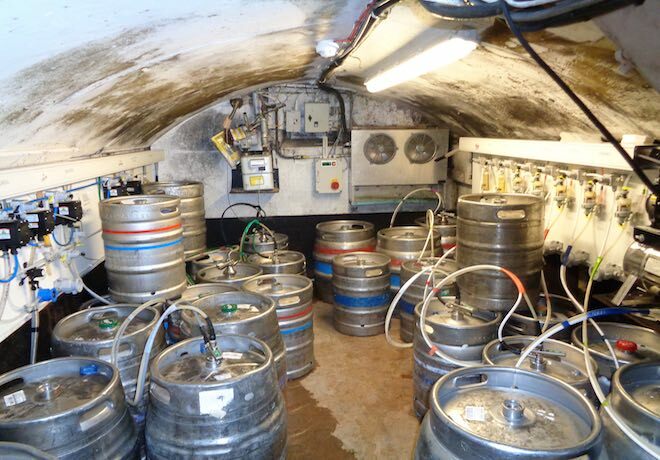 The beer engine is a device for pumping beer from a cask in a pub's cellar. Joseph Bramah an Englishman best known for having invented the hydraulic press, further developed beer pumping towards the end of the 18th century. The cask is typically located underneath the bar, and connected using a tube screwed onto the tap. 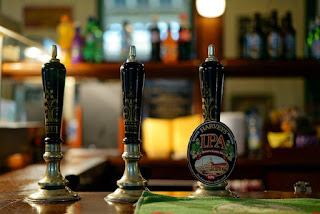 The beer is served from the cask using a hand-pump, which causes the beer engine to draw the beer from the cask due to the vacuum pressure of air. 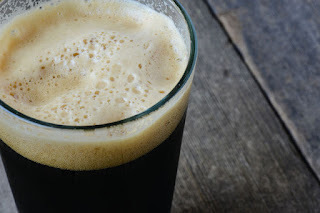 The secondary fermentation that occurs in the cask-conditioned beer due to the addition of yeast and sugar produces a delicate carbonation, while slowly developing the flavor. As a result, cask-conditioned beer has less fizz or CO2 and a complex flavor profile due to the extended action of the yeast, the introduction of a little oxygen by the hand-pump and the period of maturation under cellar temperature. These conditions are often referred to as the hallmark of a properly and traditionally cellared beer and the essence of beer produced using natural processes. The beer is served from the cask at cellar temperature which is normally between 45 - 55 °F. Grains provide the flavor, color and aroma to the beer and good grain selection makes a good beer. Due to the combination of lower fizz or C02, secondary fermentation by the yeast and higher serving temperature than force-carbonated beer, cask-conditioned ales have a smooth, creamy mouthfeel and a variety of subtle flavors from the malted barley, yeast and hops. Some pubs may use a device called a sparkler attached to the nozzle of the beer engine. The sparkler acts like a sprinkler and beer dispensed through a sparkler becomes aerated and frothy which results in a noticeable head. Sprinkler dispensed beers are visually appealing, have a softer, creamy head, but tend to lose some flavors, specifically the bitterness from the hops. Cask-conditioned beer has a shorter shelf life due to the presence of the yeast, and oxygen getting into the casks from the air pump, which make the beer stale after a period of time. Additionally, once the yeast has finished working on the sugar, they decompose and die giving the beer a sour taste. Due to the limited shelf life of cask-conditioned beer, pubs may not offer this option if they cannot sell their beer quickly. Due to the limited shelf life of cask-conditioned beer, force-carbonated beer became an alternative to the natural carbonation method for beer. It is an artificial method of carbonation as C02 is artificially or forcefully added to the beer. 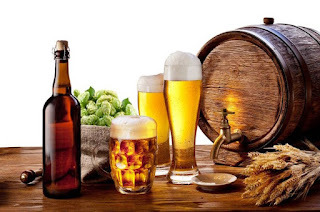 Force-carbonated beer is also referred to as keg beer and it is often filtered and/or pasteurized, both of which are processes that render the yeast inactive. This method of carbonation is called forced carbonation to distinguish it from the natural carbonation occurring in cask-conditioned beer. Beer kegs are made of stainless steel, or less commonly, of aluminum. 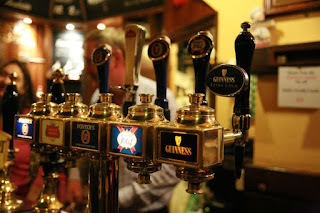 Most beer taps at a bar contain two lines, one for the beer and the other that connects to a C02 tank. The beer line is a long metal tube called a 'spear' that reaches almost to the bottom of the keg and is use to draw the beer out of the container. The beer tap works by using air pressure from the C02 tank to force the beer out of the keg, through the tube and into the glass. Simpler systems for home use, will have a hand pump for pumping the beer out of the keg. 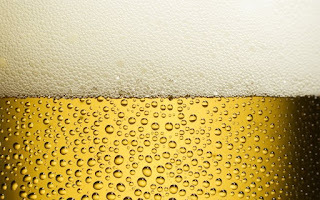 When beer is carbonated with pressurized CO2, the carbon dioxide that is dissolved in the beer forms bubbles. These bubbles grow and accelerate as they rise by feeding of nearby smaller bubbles due to a phenomenon known as Ostwald ripening. 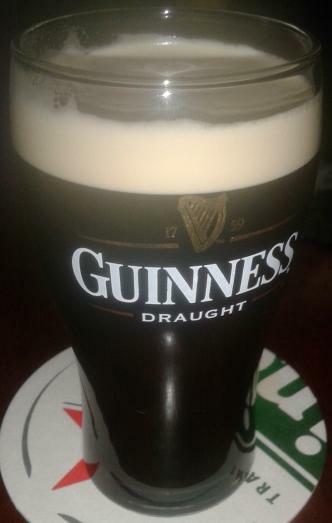 These larger bubbles create a 'coarser' foam on top of poured beer. Beer is said to be nitrogenated when infused with a mixture of nitrogen gas and C02. This mixture is usually 70-75% nitrogen and 25-30% CO2. Nitrogen is less soluble in water than C02 hence it gives beer a different texture, stable, soft foam and a thicker, smooth mouthfeel due to its smaller bubbles. Additionally, nitrogen beer taps are often fitted with a restrictor plate that both slows down the speed of the pour and also agitates the beer as it is poured, which causes the thick foam when the beer is poured. The combination of nitrogen and the restrictor plate also gives the beer its cascading bubble effect when poured from the beer tap, as the undissolved nitrogen escapes from the beer. 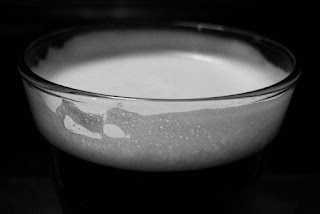 Nitrogen-carbonated beers are mostly associated with stouts and porters, the most popular example being Guinness, who pioneered this technology. Nitrogen gives the beer its thick and creamier mouthfeel that emphasizes the malt character in beer. However, these days many different styles of beer use nitrogen to create a smoother creamier texture and a long lasting head of dense bubbles. 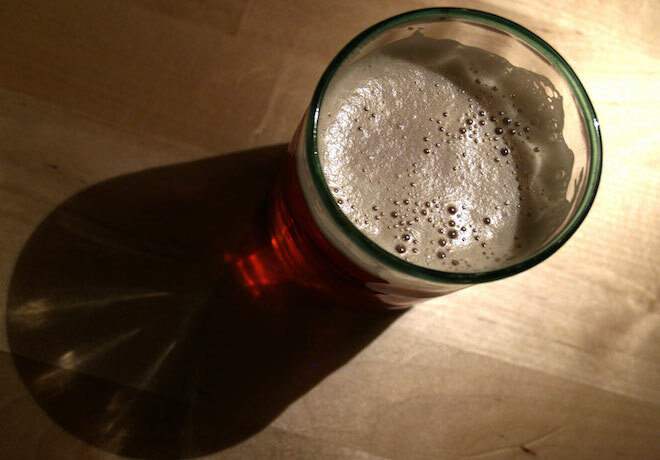 Nitrogenated ales due to its lower proportion of C02 and its fuller and creamier mouthfeel provide an experience similar to the traditional cask ales without the risk of degradation due to oxidation. Force-carbonated beer was introduced in the early 20th century in the United Kingdom. Watneys Red Barrel is said to be the first beer to be served from a pressurized container in 1931. Red Barrel was originally developed as an export beer that could be transported for long distances by sea, hence the beer was filtered to remove the yeast and pasteurized for stability. However, it was only after the mid-20th century that force-carbonated beer started being adopted in the United Kingdom and the rest of the world. This process was met with resistance from those that opposed, the growing mass production for beer and the homogenization of the beer industry. Force-carbonated beer has a higher fizz due to its artificial carbonation process. It is also served at a lower temperature than cask-conditioned beer as the keg needs to be kept at a cooler temperature for the beer to absorb the gas. The combination of fizz and cooler temperature gives force-carbonated beer its sparkle and lively quality, help push out the aromas from the beer due to the fizz, but this often comes at the expense of losing some subtle flavors, specifically from the hops and yeast. The beer also has a different texture which is coarse as compared to cask-conditioned beer, due to its large bubbles from forced carbonation. Some part of the C02 combines with the beer to form carbonic acid. 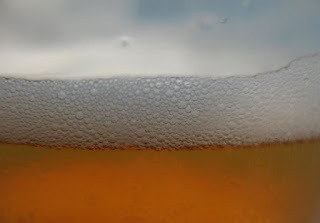 Highly carbonated beers can result in high carbonic acid which will alter the flavor of the beer and dramatically change its original flavor profile, coming across as more bitter and slightly sharper on the tongue. Often letting a chilled highly carbonated beer, warm up a little before sipping, and swirling the glass to knock some of the C02 out, brings out some of the flavors of the beer ingredients. Nitrogen gas due to being less soluble in water and having smaller bubbles gives nitrogenated beer a different texture and mouthfeel that is more creamier and fuller. Nitrogenated beers also have less C02 and hence preserve some of the flavors that are masked due to carbonation, besides the foam is soft, dense and stable making them taste more similar to cask-conditioned beers. Though nitrogenated beers have traditionally been associated with the malt heavy ales and porters, in recent years they have also been experimented with other styles of beers. Nitrogenated beers complement the malt based ales and porters giving them a smooth and fuller mouthfeel but they can change the flavor and aroma of a strong styled IPA by hiding the bitter flavor from the hops. Beer that is packaged in a bottle or can is also carbonated, either naturally or artificially. The process of natural carbonation relies on secondary fermentation, by adding a little active yeast and sugar in the bottle at bottling time. Once the beer is bottled the yeast begins to act on the sugar creating C02 that is absorbed by the beer giving the beer its fizz. These beers are called bottle-conditioned beer and tend to have a deeper character and flavor, besides a natural, delicate carbonation. Bottle-conditioned beer must be stored at a cool room temperature. If stored at a very cold temperature, the beer will be flat and lose its flavors as the temperature slows or stops the yeast from fermenting the beer. If stored under warmer conditions, the yeast will ferment quickly resulting in over-carbonation while also shortening the life of the beer. Beer that is bottled using pressurized C02 gas is referred to as artificially-carbonated beer. In this method, the oxygen is first purged out of the bottle using C02, before filling it with the beer from the keg. 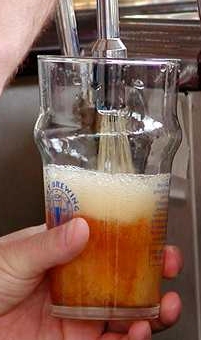 The process uses a filler called beer-gun which has two separate lines for the gas and beer. The gas line is connected to a pressure controlled C02 tank and the beer line connects to the keg. Alternatively, a counter-pressure filler can also be used, in which case the bottle is flushed and then pressurized with carbon dioxide before filling with beer. 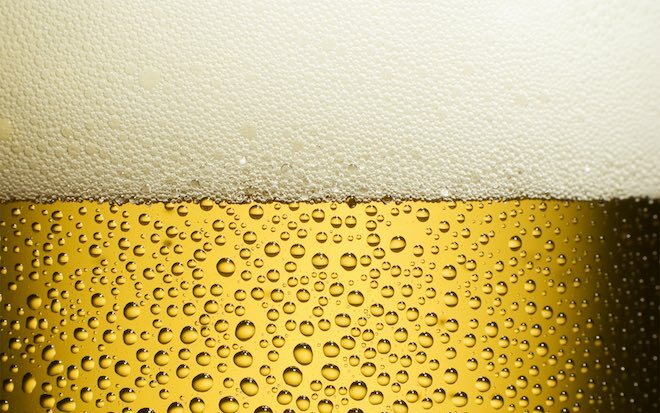 Most beer sold in bottles is artificially carbonated. Guinness packaged in a can relies on its proprietary nitrogen ball widget to create a smooth, creamier mouthfeel and long lasting foam. Guinness uses a nitrogen filled capsule that creates the bubbles and foam when the can is opened, due to the change in air-pressure, thereby replicating the draught experience in a can. Though artificially carbonated beer and nitrogenated beer is gaining popularity among brewers, many beer consumers argue that the production of beer must rely on natural brewing and cellaring processes and the flavor of the beer must highlight its key natural ingredients of malted grain, yeast, hops and water. Force carbonated and nitrogen-carbonated beers use C02 and nitrogen gases to introduce more fizz and longer shelf life for the beer using artificial means. In 1971, The Campaign for Real Ale (CAMRA), a consumer organization, was founded in England, to protect traditional, naturally carbonated beer and brewing methods. The group devised the term 'real ale' to differentiate between beer served from the cask or bottle using natural conditioning and beer served using artificial carbonation. CAMRA defines 'real ale' as a natural product brewed using traditional ingredients and left to mature in the cask or bottle from which it is served, through a process of secondary fermentation.